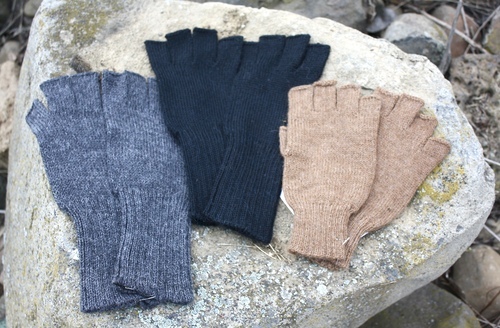 Bottom of middle finger to start of ribbed collar: Large 4:, Medium 3.5"
Thumb length: Large 2.5"; Medium 2"
Pointer finger: Large 3.25"; Medium 2.5"
Ring finger: Large 3.25"; Medium 2"
Though beautifully fashionable, many have reported also using these warm alpaca gloves inside other gloves. What a great idea! Wear thick outer snow gloves with these more simple elegant gloves inside... then when going indoors, if it's still cold, just take off the outer glove and enjoy these more nimble attractive knit ones. Brilliant!